Les plus grands experts internationaux dans l'art et la science de la guérison sonore sont des enseignements et collaborent sous l'effigie de L'ACADEMY DE SONOTHERAPIE. Ces honorables et respectés instructeurs interviennent et enseignent pendant nos stages, formations, et retraites vibratoire. Formerly known as Baba Don and Guru Jagat. Grand Gong Master Don was one of the five original Kundalini Yoga Teachers designated by Yogi Bhajan in 1969. Don also studied the gong writings of Dane Rudhyar. He established the Nanak Dwara Ashram Teacher Training 1970-1976 in Phoenix, Arizona. His very first teacher as a Teenager in 1952 was Paramahansa Yogananda, receiving his Kriya Initiation in 1953. Don originated: The Gong Yoga of Holistic Resonance, the title of Gong Master, Gong Therapy, The Gong Bath, The Gong Puja, and Songs and Concerts for Humanity. He conducts Gong Master Training Internationally in the Way of the Gong. Don has continually produced Gong Masters in many countries of the world; he also conducts his Mysterious Tremendum Gong Consort and Sacred Tone Ensemble throughout the world since 1969. Today past his 80th year he continues to teach the art and science of Sacred Geometry, divination, and designs World Peace Gong & Bell Gardens of which there are now six established Internationally. All are dedicated to the coming first day of World Peace, Planetary Cooperation in a world without violence for our children of the New Millennium. ZACCIAH BLACKBURN, Ph.D. is a gifted intuitive, teacher, sound healer, and Sacred Sound channel, trained in classical healing and shamanic traditions, and Sacred Sound cultures. He teaches internationally, and practices in Vermont, USA, at the Center of Light Institute of Sound Healing and Shamanic Studies. Zacciah shares authentic trainings in the nature of human consciousness, authentic being, explorations into the Shamanic worlds of Earth Energies & awareness, and teachings on the nature of sound, and Sacred Sound practices, as a therapeutic healing modality. His in depth understanding provides life transforming experiences into the authentic nature, being, and wellness of who we are as spiritual beings. Zacciah is one of the few practitioners offering a full training in the intuitive arts of sound healing therapies that can stand alone as a therapeutic application, or be applied to many of the current modalities of the healing arts. STEVE GORN's bansuri is featured on the 2011 Grammy winning recording, “Miho – Journey to the Mountain,” with Dhruba Ghosh and the Paul Winter Consort, as well as the Academy Award winning Documentary film, Born into Brothels. He has performed Indian Classical Music and new American Music on the bansuri bamboo flute in concerts and festivals throughout the world. His gurus are the late bansuri master Sri Gour Goswami, of Kolkata, and Pt. Raghunath Seth of Mumbai, who he often accompanied in concert. His performance with Pandit Ravi Shankar’s disciple, Barun Kumar Pal, at Kolkata’s Rama Krishna Mission, was televised throughout India. In 2013, he was awarded the Pandit Jasraj Rotary Club of Hyderabad Award for Cross Cultural Achievement. His numerous recordings include Luminous Ragas, Rasika, with tabla by Samir Chatterjee, Illuminations, with Nepali bansuri wallah, Manose, the landmark Indian-Jazz fusion recording, Asian Journal, and Pranam a jugalbandi with Barun Kumar Pal playing hansaveena, and Samir Chatterjee, tabla. Arimany’s musical innovations have forked into another avenue where they are being applied to sound therapy and transformational processes . On this field his contribution is remarkable as he has entirely composed, performed and produced the music of inTime a 9CD rhythm-based music listening therapeutic method created to improve brain function, developed in collaboration with Sheila Allen and Advanced Brain Technologies. The official debut of inTime was held in February 9th 2014 at Rockefeller’s University , Caspary Hall with a panel discussion with neuroscientists and therapists, and a solo concert by Nacho Arimany. Internationally renowned composer-singer, contemplative teacher, retreat leader, and harmonic pioneer, David Hykes was born in Taos, New Mexico in 1953. He founded Harmonic Chant, his "music of the spheres of being," in New York in 1975, and the western world’s premier overtone ensemble, DAVID HYKES AND THE HARMONIC CHOIR, in the same year. He has lead contemplative spiritual retreats devoted to the Harmonic Presence teachings and practices since 1980, and has collaborated with HH the Dalai Lama, the Mind and Life Institute, the Gyuto and Gyume monks, Sister Marie Keyrouz, Smt. Sheila Dhar, and the Nagi Gompa Nuns. Barbara Threecrow, Tunka Hota Wiyan (Gray Stone Woman) is a mother, grandmother, author of Mending the Hoop, Four Sacred Shields Twelve Sacred Paths, an award winning artist, healer and ceremonial leader in the Lakota tradition. She has created Core Methodology a unique method of healing that guides clients into a deeper understanding of the dramatic effects of trauma during childhood. Click here for information on Core Methodology. Barbara's heritage is Irish, her Native American heritage is Nanticoke/Delaware. She was a long time student of the late Lakota medicine man Wallace Black Elk. She is a facilitator of the Medicine Circle Way- an exploration of the Grandmothers Earth Ways. Barbara created the Star/Indigo Children workshops presented at the Teachers Development Conference and leads spiritual journey‚s to Easter Island and Bogota, Colombia. Kuricharik, also Known as Oscar Santillan comes from a family of seven generations of healers and musicians, who have preserved the wisdom and music of their Quichua culture for centuries. It is part of the teaching of the elders of the Andes that now is the right time-space for them to share some of their traditions. Don Alverto Taxo is an important teacher of Oscar. Their lineage centers on opening the heart and on the natural elements and bringing the natural world actively into our lives. Along with his family, they keep both the music and ancient wisdom of the Andes alive. He offers sound energy healings incorporating his handmade herbal incense, energetic plants, condor feather flute, and chanting. Performance with traditional instruments, some which are sacred and date back thousands of years. 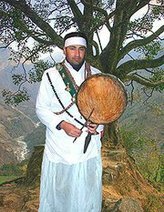 PRAMOD SAPKOTA is a Brahman Shaman from the Kavre District in the Central Zone of Nepal. As a member of the Makaisaau Sapkota clan (The Keepers of the Corn), whose Clan Goddess is Vajrayogini, he is part of a shamanic lineage carried down by his ancestors for fourteen generations. Also an environmental activist, Pramod works with remote settlements of hill people who are being displaced from the land where their families have lived for centuries because of severe droughts brought on by vanishing snow coverage in the nearby Ganesh mountain range. As a shaman he works with the Nature Spirits--honoring them and praying to them--and also teaches about global warming and the effects of eating food poisoned by industrial farming methods. Pramod has assisted for many years, as a volunteer, with the Council of Indigenous Grandmothers, and is pursuing an MA in Anthropology from Tribhuvan University in Katmandu. SILVIA NAKKACH, M.A., MMT Named by Utne Reader magazine as one of 40 cutting-edge artists that will shake the art world in the new millennium, a award-winning composer, performer, former psychotherapist, and an internationally celebrated pioneer in the field of sound, consciousness transformation, and music shamanism. She is the founding director of Vox Mundi School of the Voice, a worldwide project that had devoted more than 25 years to preserving sacred and indigenous musical traditions, combining education, performance and spiritual service, with centers in USA, Brazil, Argentina, India, and Japan. Silvia is also in the faculty of the California Institute of Integral Studies in San Francisco, where she has created and leads the world’s premier Certificate in Sound, Voice and Music Healing established in a high academic institution. An internationally accredited specialist in cross-cultural music healing training, she has pioneered the integration of sacred sound with contemporary practices of music improvisation, and she has contributed an extensive body of vocal techniques that have become landmarks in the field of sound healing and music therapy, widely used in Palliative Care, Hospices, and Healthcare Centers worldwide. Nakkach significant body of work has been integrated in an innovative curriculum of sound and vocal principles, theories, and applications called The Yoga of the Voice, available through the Vox Mundi Project programs, archives, and publications. Her interest in indigenous music cosmology and spirituality has led her to collaborate with many traditional healers, modern mystics, and master teachers of the Indian and South American shamanic traditions. For 29 years, she studied Indian classical music and the ragas under the direction of the late great master Ali Akbar Khan. As a community activator and educator, she travels extensively throughout the world facilitating seminars and retreats, and offering keynote presentations and concerts. Ancient Andean wisdom teaches us that the earth was made while the creator sang, thus all beings are made of sound, rhythm and harmony. Tito is sound healer, Andean musician, composer and recording artist. Through his concerts, flower ceremonies and Sound awareness classes La Rosa helps reawaken our memories - weaving sounds into frequencies that open the heart and encourage the spirit to soar. La Rosa, a descendent of Quechua Indians of the Peruvian Andes, has spent more than a decade recovering and preserving, studying, and intuiting the ancestral music of Peru. Tito is a Curandero de Sonido – sound healer. When performing ritual and ceremony for healing, he enters into parallel worlds to bring forth sound that elevates the vibration of an individual and allows for healing and balance to occur. He teaches sacred sound in a magical, experimental and experiential class - a journey through the acoustical universe of ancestral Peru. With him you will explore the uses of the instruments and their applications to healing body, mind and spirit. Working with a variety of instruments such as whistling vessels, zamponas, bamboo flutes, patutos (conch shells) ceramic antaras, feathers, seeds, shakapas, bells and drums Tito makes you discover their uses in healing and their connection to the realm of spirit. A master on exploring how to use these instruments in ceremonies and rituals, his teachings are taught using the knowledge and principles of the Cosmovision of the Peruvian Andes. It is a powerful and yet simple course on how to work shamanically with sound. Its teachings apply to all of life. Born in England in 1963, Andrew Steed studied Communication and Theater Arts in London as a young man. He has traveled extensively throughout Europe, Asia, and North and South America, gathering stories and illuminating experiences. These journeys have allowed Andrew to learn how to connect and communicate effectively with people from all walks of life and on many different levels. In 1996 Andrew established his creative, bardic storytelling style by speaking to people of all ages, leading corporate training seminars and facilitating soulful travel. His diverse and progressive healing practice is designed to empower people to remember themselves and communicate effectively with one another. His mission is to equip people to stand in their own power, to own their unique voice, to be phenomenal team players with exceptional interpersonal communication skills. Andrew’s ultimate goal is to help people be the author’s of their own story so they dance the depth of their own dreams. Providing exceptional educational opportunities that people listen to and act upon; Andrew uses experiential learning and heart-to-heart stories to involve his audience in customized seminars and journeys.